Kevin: Our objective in foot patrol is to be out and be visible. We get to feel a part of the community. We talk to business owners. We talk daily with all the homeless people. We know them by name and check on them. Matt: It allows us to provide a high quality of policing to people who live in this area. Say someone shoplifts a pair of shoes from a store. We might know who the person is and where they hang out based on a description. Because we have the time, we can ask around. People will give us info. They trust us because they see us all the time. Kevin: I had always wanted to do something in service. When I was young, my parents were involved in all kinds of volunteer stuff in the city. I grew up here in Seattle. Went through Seattle public schools. Working in Seattle was my number one choice. It’s my home. When I come out here and work, it has much more of a connection. That’s a big motivator, to be here, to be a positive part of the place where I live. I’m extremely lucky that I found something I love. Matt: Kevin and I have that in common. We both love this city. I’ve lived in Seattle for 20 years and Seattle is the only department I applied for. 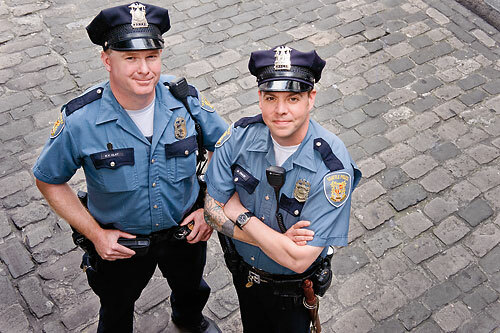 I always wanted to be a cop, but I only wanted to be a cop in Seattle. I was lucky to grow up in this city. The people who were working as police officers when I was growing up made it safe to live here, so it’s really important for me to do something so that kids now can have a safe place to grow up.